Each headline tells a story about language and leadership. The first introduces the Doomsday Clock, conceived in 1947 by scientists who had participated in the Manhattan Project. The symbolic clock represents a countdown to possible global catastrophe – signified by midnight on the clock. 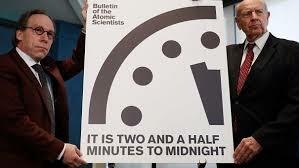 It just advanced 30 seconds to 2 ½ minutes to midnight, a time not seen since 1953 at the height of the cold war. The Bulletin of Atomic Scientists (who manage the clock) were disturbed by “reckless proclamations about clear facts” by our President, whose words created profound uncertainty of our commitment on two fronts: climate change and nuclear weapons. The second headline in the New York Times dealt with what to call false claims about obvious and evident facts. The story details a linguistic dilemma and a new reality: What do you call a President who routinely is unwilling to recognize verifiable truths? The Times – our nation’s paper of record – reached a threshold. They could no longer participate in the deception. It was time to define terms: a falsehood is an error of fact, unlike a lie which is an intentional falsehood. While these headlines indicate a “new abnormal”: how to deal with truth and facts; they actually deal with leadership and language – and what happens when a leader refuses to accept responsibility for his language. 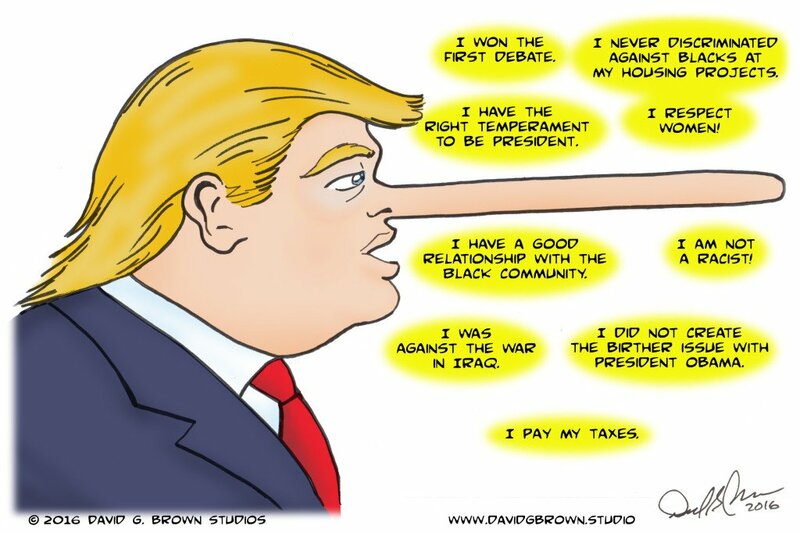 Sure, most politicians fudge and exaggerate facts, but we’ve not had a president, who, as a matter of daily routine, conflates selected facts with fabrications to satisfy his latest whims. This is compounded by an Information Age, which finds 140 characters ricocheting globally at the speed of thought. Humans are constituted in language. We live, work, play, survive — succeed and fail — based on words: The impact of our words, and our ability to count on the words of others. Our homes, cars, education, utilities, marriages and lives revolve around a set of agreements that we accept and affirm with regular deeds. This “foolishness” was highlighted in an Atlantic Monthly essay by Salena Zito, titled “Taking Trump Seriously, Not Literally,” positing that Trump’s supporters (unlike journalists) take him seriously not literally. Zito points to a valid description, not a prescription, of the Trump language dilemma. Still, political supporters unlike journalists or elected officials are not mandated to trade in truth; they can be casual with facts and react erratically, consequences be damned. This view (seriously vs. literally) of language divorces impact from intention (responsibility of authorship), especially when amplified globally. Leaders do not have this luxury. If we cannot take a leader’s words literally, we are doomed to guess its meaning or intentions. We are unable to use language to construct relationships, agreements, or shape futures – the very purpose of leadership. Worse yet, in turbulent times, erratic meaning only increases uncertainty and confusion. Indeed, we advance our Doomsday clock forward by 30 seconds. This self-fulfilling prophecy is constructed by our relationship to language, which determines how we use language – the relationship precedes usage. Leaders bear an outsized burden of this phenomena as their words hold more weight, influence more minds, and can construct realities that impact events. Political leaders are at the effect of dozens of moving parts in an ever-changing world. Our mindset is aligned with a relationship to language that determines how we hold words. A leader’s word can conform to situations or can create situations. We can be governed by circumstances or we can govern them. It all depends on whether you view your word as describing deeds or your word as deeds. The former finds us juggling “unintended” consequences. What follows are four relationships to language. The first three view our word as related to, or describing, circumstances, each with degrees of fullness. The fourth stage is qualitatively different as it recognizes the power of language to alter context to define circumstances. Transactional: This mindset relates to language as a tool to assert power in any way possible to transact situations. Viewed as an opportunist and impulsive. Leadership: Good in emergencies and in pursuing sales. Tendency to focus on personal wins and sees the world and other people as opportunities to be exploited. Relationship to transactional language: transacts goals without concern for facts or consequences. Impact: erratic, confusing, and reckless. In effect, their world dictates their word (what they say). Representational: This mindset is concerned with the intention of getting it right. Using language to accurately portray the facts in any situation. Leadership: They gain control of one’s own behavior, are supportive glue on teams. Will make safe promises and predictable requests to be safe and predictable. Relationship to representational language: accurately describes events and conditions to discern facts. Intention: Clear and Intentional on facts. Impact: factual, reliable, and consistent. In effect, their word conforms to their world. Analytical: This mindset is concerned with the intention of accurately assessing and connecting patterns from evidence and conditions to predict reality. Leadership: Well suited to managerial work; action and goal oriented. Will make promises and requests that are strategic. Relationship to analytical language: can be counted on to discern patterns to explain, and predict situations. Intention: Deliberate regarding patterns and knowledge. Impact: understanding, strategic, and analysis. In effect, their word explains their world. Generative: This mindset employs language to shape context that alters events without any evidence. Seen as self-authoring and creative. Leadership: Generates transformations over the short and long term. Will make promises and requests that seem impossible in the current context. Relationship to generative language: can be counted on to view conditions, and alter context to shape future. Intention: Clear about their intentions, words, and actions; there’s no space between intention, word, and action. Impact: Dynamic, creative, purposeful. In effect, one’s word creates one’s world. At first glance, Transactional and Generative language may look the same. The difference here is one of intention and responsibility. Those operating in transactional language lack intention, living at the effect of circumstances – as in whether they win or not. 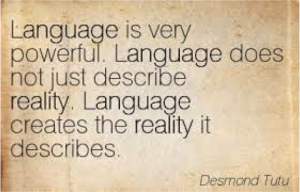 Those relating to language as generative appreciate that words reveal worlds that matter not only when spoken but as intentions — the alignment of thought and purpose in action and impact. Leaders who operate from generative language – my field of study for nearly two decades, see ebook – integrate full human faculty of observation, interpretation, and imagination to own their intentions and words as action (not as describing action). 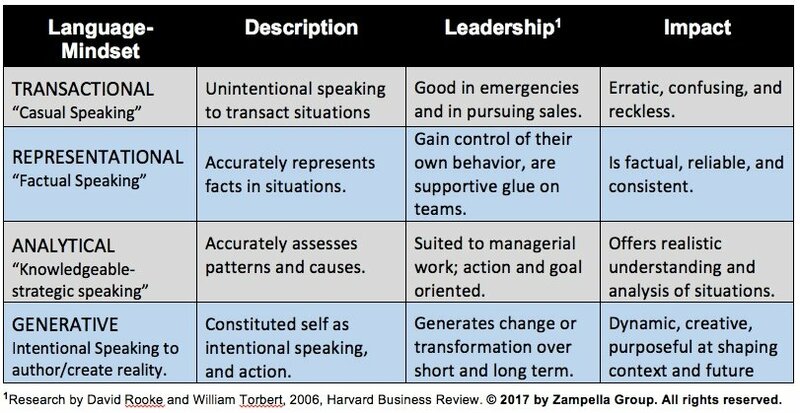 Here’s the rub: by engaging profound change, all leaders — whether aware of it or not — speak in generative echoes: They both act and represent action. As symbols of change, they speak without uttering a word. Leaders who believe their words and actions are separate must then become expert at explaining, dissembling, and convincing others what they “really” meant. For instance, for Trump promises are not generative, to be delivered as intended; for him, promises are transactional – serving only as the starting point of negotiation. In that context, no one can ever know what he intends or stands for. He cannot be held to his words; therefore, he must spend a great deal of time and energy clarifying his intentions based on the best deal, or what it takes to win. Much of a leader’s time and bandwidth is then devoted to cleaning up and clearing up the past, with very little left to create a future. Leaders charged with creating futures can’t afford a sustained focused on past intentions (what I meant? ), speaking (what I said?) and actions (what I did? ); they must stand for something and operate from a clear commitment to a future. For instance, John F. Kennedy was a symbol of a youthful future. With that, JFK’s declaration that … “We will place a man on the moon and return him home safely by the end of the decade,” spoke a future that created that possibility in the hearts, and minds of all Americans. In his speaking, JFK focused attention, aligned resources, shifted agreements, and created urgency merely because he was willing to speak and act with intention – and we knew it. At the time of Kennedy’s declaration, the metal to construct such a spacecraft had yet to be invented. The closest Trump has come to anything generative is in his declaration to “build the wall,” except that in each instance he lacks intentional speaking, saying whatever is required to satisfy crowds in front of him. More significant, is the context in which Trump’s “Wall” is spoken and heard: his past deeds and words construct a background, defining him as a symbol that colors all speaking. As the leader of “birtherism” with a willingness to trade in prejudicial discourse, Trump’s Wall (content) cannot be divorced from his background (context) which leads to perceived intentions that color all speaking. 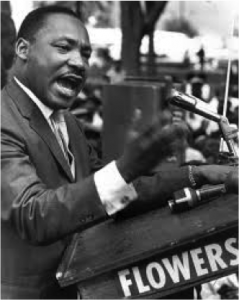 Leaders lacking the discipline of intentional speaking and action (which Trump dismisses) can only create change through force, not the power of their words. Those related to language as generative make a tradeoff: They purchase power with responsibility and are willing to be held accountable. The source of power for generative leaders is not found in evidence by in being fully responsible for their words. 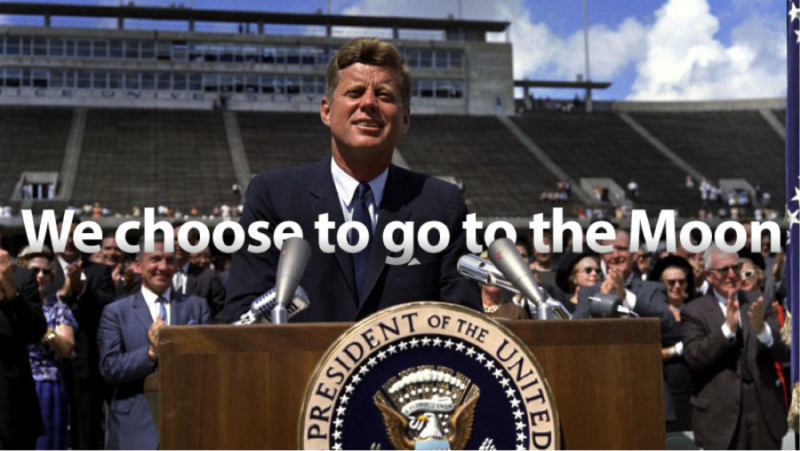 Each speaker at each stage of language, would relate differently to JFK’s statement. Transactional simply proclaims items for effect, and then moves on; perhaps adjusting semantics later, denying ever having said it, or quibbling with how others misinterpreted meaning. Sound familiar? Representational would find the facts of the vision and figure out what’s missing to make it true. If what’s missing was impossible to create, then the statement would be dismissed. Analytical would analyze the systems and trajectory of current knowledge to develop a plan for some future date when the knowledge might work, then play the odds to establish a realistic plan. Generative would create the reality in a declaration vivid with details and dates to capture imagination, focus on facts (representative) and gather knowledge (analytical) to bring forth the future, now, and move it forward as a possibility. And they are willing to be held accountable for bringing it into being. The issues here lie at the intersection of language and leadership. Unlike strategic planning, which requires careful management based on evidence, leaders are called to cope with change and shape the future without any evidence. Bringing forth unpredictable futures requires future-based language (as generative) spoken from possibility, and from the depths of responsibility and integrity. The profound nature of what’s possible when we situate ourselves as creators in language alters how we act, learn and create change. All speaking and all listening in this domain is intentional and grounded in our word as the source of action. It cannot be spoken by those with a weak relationship to their “word.” At some point leaders constitute themselves in language, understanding that to lead is to create reality. Our current President has not moved beyond his personal whims and is unwilling to see or accept the responsibility for his speaking, or the way his speaking is interpreted. He fails to grasp the power of words – stuck in verbal gymnastics about political correctness. He fails to understand that intentions shape focus and action follow focus. He fails to understand that leaders are always saying something, beyond what is uttered. He fails to appreciate that it all occurs in language (as a system of thought and meaning). In the absence of these realizations, we are all held captive to guessing, and quibbling – careening between Oxford dictionary definitions and fact-checking accounts – to determine what is actually being said. We are stuck in a quicksand of terms unable to leverage the power of language – unless and until an adult enters the room. In Orwellian manner, we are all drunk waiting for a designated driver to take us through these next four years.